With high security Software Blades performance and great scalability, the 12600 Appliance is a datacenter-grade platform offering advanced redundancy and modularity. In addition to two onboard 1 Gigabit copper Ethernet ports, three available expansion slots can be used to configure a variety of network options such as 1 Gigabit Ethernet copper, 1 Gigabit Ethernet fiber, and 10 Gigabit Ethernet fiber connections. The 12600 default configuration includes eight 1 Gigabit Ethernet copper ports and a four 1 Gigabit Ethernet copper port expansion card. Fully loaded, the 12600 includes a total of twenty-six 1 Gigabit Ethernet ports or twelve 10 Gigabit Ethernet ports. 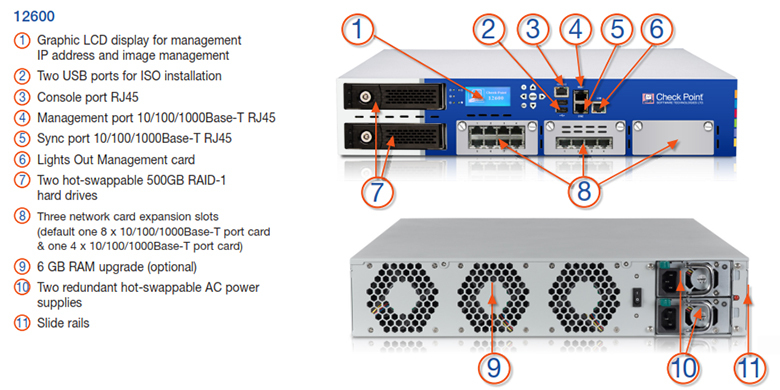 The 12600 includes Lights-Out-Management (LOM) and hotswappable redundant disk drives and power supplies. The 12600 Appliance is a two rack unit (2RU) security appliance, with 2050 SecurityPower Units, that offers real-world firewall throughput of 14 Gbps and real-world IPS throughput of 3.58 Gbps. Until today security appliance selection has been based upon selecting specific performance measurements for each security function, usually under optimal lab testing conditions and using a security policy that has one rule. Today customers can select security appliances by their SecurityPower ratings which are based on real-world customer traffic, multiple security functions and a typical security policy. The Check Point 12600 Appliance offers a complete and consolidated security solution based on the Check Point Software Blade architecture. The appliance is available in four Software Blade packages and extensible to include additional Software Blades for further security protection. Next Generation Firewall (NGFW): identify and control applications by user and scan content to stop threats-with IPS and Application Control. Customers with high connection capacity requirements can purchase the affordable High Performance Package with the Next Generation security package of their choice. This includes the appliance plus a 4x10Gb SFP+ interface card, transceivers and 12 GB of memory for high connection capacity. The Check Point 12600 appliance delivers business continuity and serviceability through features such as hot-swappable redundant power supplies, hot-swappable redundant hard disk drives (RAID) and an advanced LOM card for out-of-band management. Combined together, these features ensure a greater degree of business continuity and serviceability when these appliances are deployed in the customer's networks. Standard (W x D x H): 17.24 x 22.13 x 3.46 in. 1Maximum R77 production performance based upon the SecurityPower benchmark. Real-world traffic, Multiple Software Blades, Typical rule-base, NAT and Logging enabled. Check Point recommends 50% SPU utilization to provide room for additional Software Blades and future traffic growth. Find the right appliance for your performance and security requirements using the Appliance Selection Tool. Download the Check Point 12600 Appliance Datasheet (PDF).